Kamasi Washington, left, and Herbie Hancock. The jazz luminaries have announced they will be going on tour together this year. Photo of Kamasi Washington: Getty Images. Photo of Herbie Hancock: courtesy of the artist. 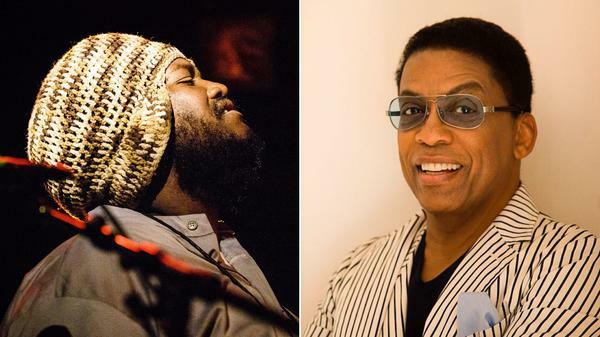 Herbie Hancock and Kamasi Washington, two of the biggest names in jazz, will join forces for a North American co-headlining tour this summer. Hancock, a 14-time Grammy-winning pianist and NEA Jazz Master, will lead a band similar to the one featured a few years ago in a Jazz Night in America concert film: Lionel Loueke on guitars, Terrace Martin on alto saxophone and synthesizers, James Genus on electric bass, and Vinnie Colaiuta on drums. Their set list will combine Hancock favorites and material from a highly anticipated forthcoming album. Hancock has long been an exemplar of jazz crossover: he's the rare instrumental virtuoso to credibly break through to a mainstream audience, let alone the pop album chart. He received his first gold record in 1974 with Head Hunters, the self-titled debut by his new jazz-funk band. At the time, the critic Lee Underwood stamped a concert review with a smirk: "Mr. Communicate-With-A-Wider-Audience, Herbie Hancock, opened to a full house recently, again pleasing the funkers while disappointing the more cerebrally oriented connoisseurs." Both Hancock and Washington will be busy in the weeks and months leading up to their tour. Hancock, as chairman of the Herbie Hancock Institute of Jazz, is preparing for International Jazz Day festivities in Australia at the end of this month, culminating in a global all-star concert in Melbourne on April 30. Hancock is also scheduled to perform at the Beacon Theater in New York on Aug. 1, and at the Newport Jazz Festival in Rhode Island on Aug. 2 and 3. Washington is also headlining at Newport, on Aug. 3, but that's far from the only synchronicity he has with his co-headliner. Terrace Martin, a longtime Washington associate, is another one. (It seems likely that Martin will also play with Washington on the tour.) Hancock and Washington also both appeared on You're Dead!, the 2014 album by producer Flying Lotus. And there have been reliable reports that Hancock's next album-in-progress will feature Washington (along with Martin, Flying Lotus and rapper Kendrick Lamar). Moving out of the realm of the speculative, there's a bit of precedent for this tour. In 2017, Hancock headlined a concert at the Hollywood Bowl, with Washington as the opener. Reviewing that concert for the Los Angeles Times, Chris Barton painted the picture of a hometown victory lap for Washington, and a show of dominion by Hancock. "The only note missing in Hancock's arsenal was a guest spot from Washington, a seemingly natural choice that could have built a bridge between two generations," Barton wrote. "A missed opportunity for a special moment, maybe — but if you were listening, the bridge was there all along." Additional performances are expected to be announced shortly.